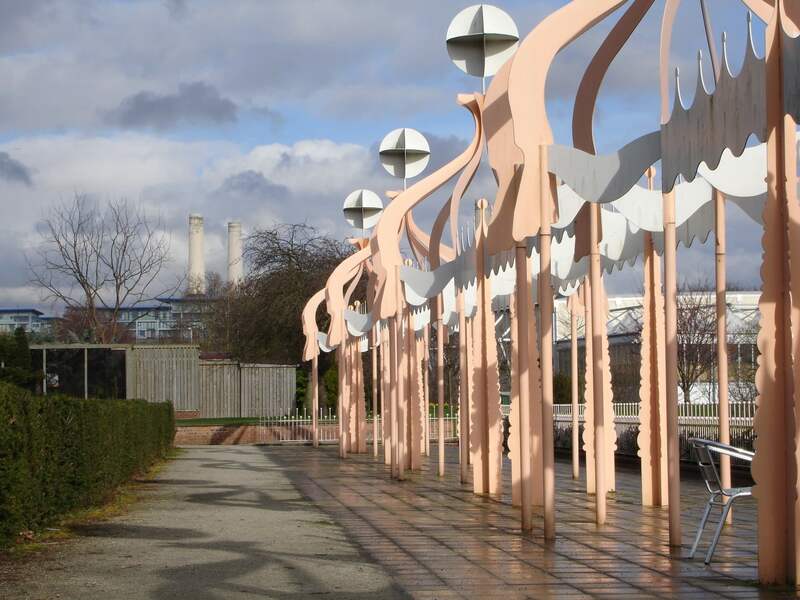 Battersea Park is a riverside park in the South West of London, just across a bridge from such attractions as Chelsea, Kings Road, the Royal Hospital and the National Army Museum. It is an excellent place to while away time with a toddler, or a toddler and her Tremendous Big Brother because there are so many different sections to explore – it’s not a large heath-like affair full of grass like many of the other open spaces in the area. Not that I mind that. One footpath is much like another to me, and as long as there are blades of grass to examine, dog poo to pick up, leaves to throw around, sticks to collect, ducks to feed and dogs to greet I am really not that bothered. But the sense of exploration Battersea Park provides seems to make Mama happy, so that’s good enough for me. One of Mama’s favourite areas is the Tea Garden, where there is a small kiosk that serves coffee. Mama often tries to arrange it so that should we be alone, I am asleep when we get here and she can relax in whatever sunshine is available in peace. Or at least as much peace is afforded by the numerous dog walkers who frequent the park and who also like to restore their nerves with refreshment here, meaning that there are quite a lot of bouncy animals snuffling, barking and occasionally fighting all around me. I usually only wake up, however, if they come and investigate what we have brought as our picnic lunch, which is unfortunately rather more often than Mama would like. The problem is that Battersea Park is near Battersea Dogs (and Cats) Home, and so in addition to the quite startling numbers of dog owners and professional dog sitters who use the park, there are also hordes of former strays being exercised. Not that this bothers me or my Tremendous Big Brother one little bit. Animal obsessed at the best of times, dogs are my Tremendous Big Brother’s absolute favourite and it is impossible for him to walk past a pooch without saying hello. I am much the same, although less prone to running madly towards them with my arms out shrieking my happiness as my Tremendous Big Brother was at my age, for which Mama is duly thankful. Mama’s blood pressure is also improved by the fact that my Tremendous Big Brother has learned to strike up a conversation with dog owners these days before diving in for the touch. Mama is particularly impressed by the social skill he displays in starting off such encounters with ‘What’s your dog’s name?’ rather than ‘Can I stroke your dog?’ (that’s his second question). He rarely listens to the answer but it is astonishing how many people will let him throw the ball as well as hug their pet if he pretends to take an interest in the animal as, like, an individual first. Still, Mama is torn between being grateful that Battersea Park provides us with an opportunity to indulge our passion and practise our schmoozing skills, and irritation at the sheer inconvenience of having to stop every five yards to pet some mutt. Not to mention that she suspects that every encounter increases the likelihood that she will have to let us get a dog at some point in the future. Mama is not a dog person. But back to the Tea Garden. The reason why Mama likes this bit of the park so much is that it reminds her powerfully of parks in Moscow. 1950s design. It grows on you. Lots of sculptures made of metal strips painted in bright colours, including the gazebos over the tea garden tables. There are also fountains, quite spectacular ones, with timed and ever-changing displays of water fireworks. In the summer. We are even allowed to look at them close up when Mama is feeling particularly optimistic that I won’t fling myself into the water like my Tremendous Big Brother did once when he was little. The whole section is overlooked by the Peace Pagoda, which is a Buddhist temple inexplicably plumped in the middle of the riverside walk. Mama says. It certainly has very pointy roofs. The river walk itself is a bit boring – you can’t see the river from down at my eyeline, but the paths are nice and wide there so it is good for letting off a bit of running steam. Many people ride around on bikes in this area. You can hire them, Mama says. I think the ones where you lie down and pedal look like fun, but Mama says, when we are bigger. When we can pedal and she can lie, I think she muttered, but surely that is wrong? Another of Mama’s favourite places is the walled English garden, which has been overhauled recently by what appears to be a community gardening project. Mama has a secret yen for a walled garden of her own, and this is a lovely secluded spot to take a sleeping child if you are not as coffee obsessed as Mama. It is a bit overrun by pigeons, because people eat their lunch here and someone has hung bird feeders in the trees, but I don’t mind that one little bit. I like chasing pigeons. In fact, the only reason why we don’t spend more time here is that there is a sunken pond in the middle, which Mama doesn’t really fancy fishing me out of as I fail to skid to a stop in time while after a particularly rascally bird. Mama is really against open water features in public parks. So when I am awake, we mostly head out for a walk around the big lake, which might sound even more fraught with peril except that most of it is decently fenced off. There is a café at one end which Mama rather likes, run by genuine Italians. The prices are a bit silly, but the coffee is excellent and they also do pistachio ice cream as well as rather more reasonably priced children’s food which doesn’t just consist of chips with more chips on the side. You can even take it outside to sit by the lake, although beware of the pigeons, who will swoop on your food the moment you leave it alone for a second. Mama says, speaking from bitter experience. I, of course, like the pigeons. Chasing them, at least. You can hire boats here too in the high season, but we never have. Mama feels this would be tempting fate. At the other end of the lake, Mama has fond memories of spending very happy summer afternoons in the tropical plants enclosure with my Tremendous Big Brother (before he could walk). There’s nothing quite like picnicking under a palm tree. Especially when the man who plays the saxophone all afternoon for, apparently, the sheer hell of it is in residence. Nowadays we mostly go there to feed the ducks, who are gratifyingly excited to see us, as are the swans, the coots, the moorhens, the parrots and, on occasion, the herons and the rats. Mama figures we are mostly static and wholly occupied and therefore less likely to plunge into the water, but nevertheless we usually do it last so she can head briskly for home if a quick change of a sodden child is needed. Mama is really really against open water features in public parks. Also, a little paranoid. There is also a playground nearby the playing fields and tennis courts which has different zones for different age groups. We start off in the toddler section, spend an inexplicably long time exploring the pirate ship and work our way round to the new enclosure with the really big slides and walkways. Mama really enjoys standing underneath those with her arms outstretched smiling brightly as I clamber around equipment five times too big for me. Especially when it is busy, which it invariably is at weekends when the sun is out. My Tremendous Big Brother also loves it. He always makes new friends. It is astonishing how quickly a group of five to tens can go cheerfully feral when given sufficient space and something to climb. Mama says. In good weather Mama finds lots of opportunities to spend money here too, which is nice for her. An ice cream van turns up, they lay on a Thomas the Tank Engine ride, and there is a large refreshment van. Which sells coffee. This is also the area they have the fun fair in the school holidays. Anyway. 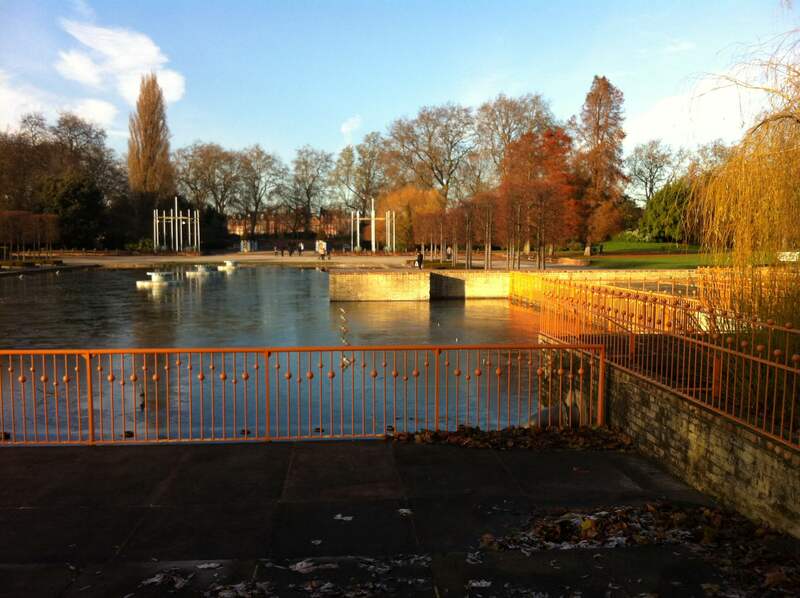 Battersea Park is a really excellent place whether you want an interesting walk, a pleasant sit down, a game of football, or a long go on a swing and slide set. It is big enough to absorb quite a lot of people without feeling stupidly crowded, and! There is also a zoo in the middle. 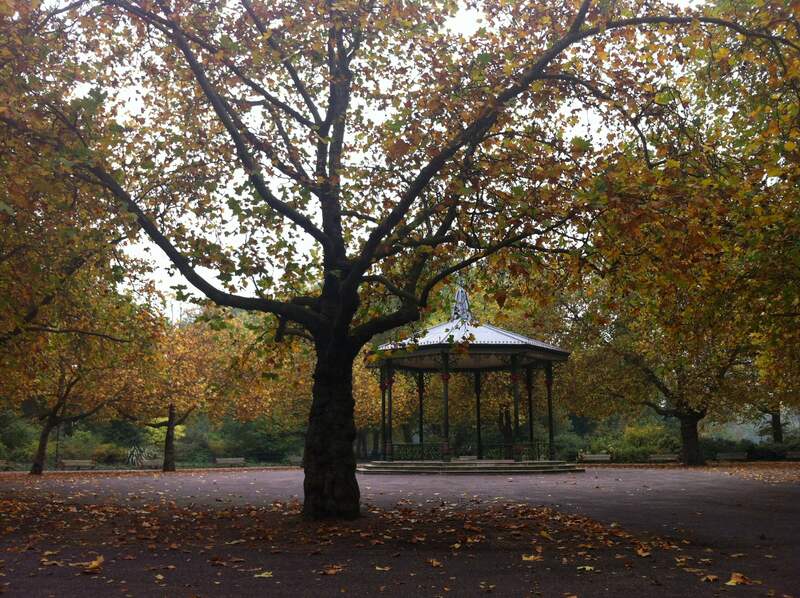 The Friends of Battersea Park website. This is what the Hitchhiker’s Guide has to say about teaching dogs basic commands. Opening: Officially, 8am to dusk. Price: The park is free to enter. 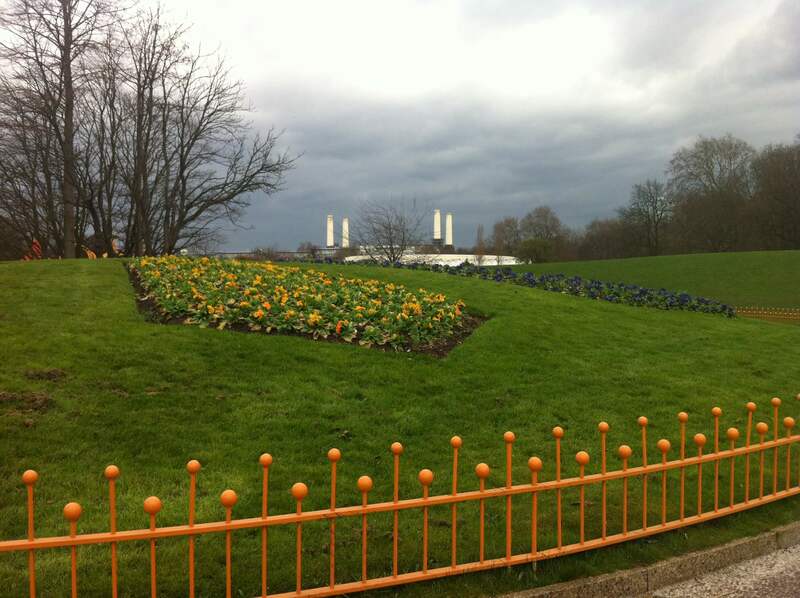 By train: Battersea Park Station and Queenstown Road Station are within 300m. By bus: Routes 19, 44, 49, 137, 156, 239, 319, 344, 345, 452 all go by or near the park. By car: There are a couple of smallish pay and display carparks within the park, and more on the roads round the park. The pay and display road parking is free on Sundays. I’ve just realised I can post comments so just wanted to say I’m still reading and still loving this series. It’s even better now than it was on h2g2 because of the pictures. Yay deb! Thank you very much! I’m glad you like it! The ducks are splendid! But it’s the parrots that sell it for Mama. London parks *are* great. And there really are a surprising number of them. Eeek! Ashamed to say still not been … although everyone says so fab. Oh well, to be fair, if you aren’t in the area.. Of course, if you are in the area, then you should so be ashamed!